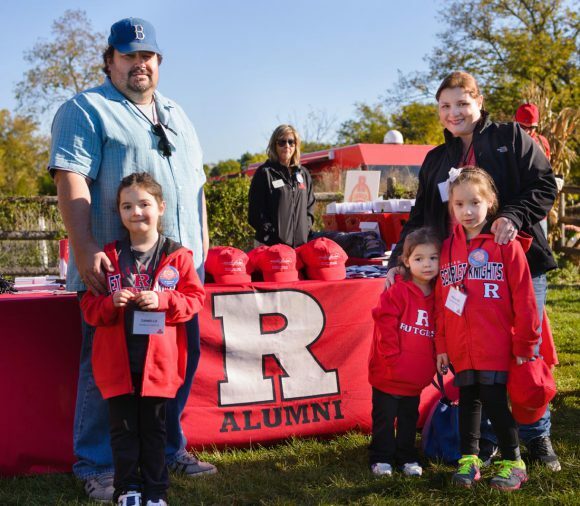 Share the post "Rutgers Alumni Families Enjoy Tailgate Party for Kids at Homecoming"
Elaine Griffin (DC’01) with her husband Dan, and daughters Danielle, Mary and Kelleigh. Photo: Fred Stucker. Editor’s Note: this story appeared as a Rutgers Today Feature. Elaine Griffin (DC’01) and her family were among other alumni and their families who enjoyed the R Family Fall Festival, held at the president’s residence before the Rutgers University Homecoming football game. Over the past three years, Rutgers alumni with young children, like Griffin, have enjoyed what has become a beloved Homecoming tradition: tailgating as a family in the shadow of High Point Solutions Stadium in a safe environment. The festival was launched in 2014 when President Robert Barchi and his wife, Francis, brought their concept of a family-friendly, alcohol-free Homecoming event to the Rutgers University Alumni Association. They suggested the lawn of their residence as the ideal location because it is a contained area close to the stadium but tucked away from the more boisterous environment in the parking lot. Throughout the grounds, families mingle, enjoying seasonal food, arts and crafts, carnival games and animal attractions such as pony rides and a petting zoo sponsored by the School of Environmental and Biological Sciences (SEBS).